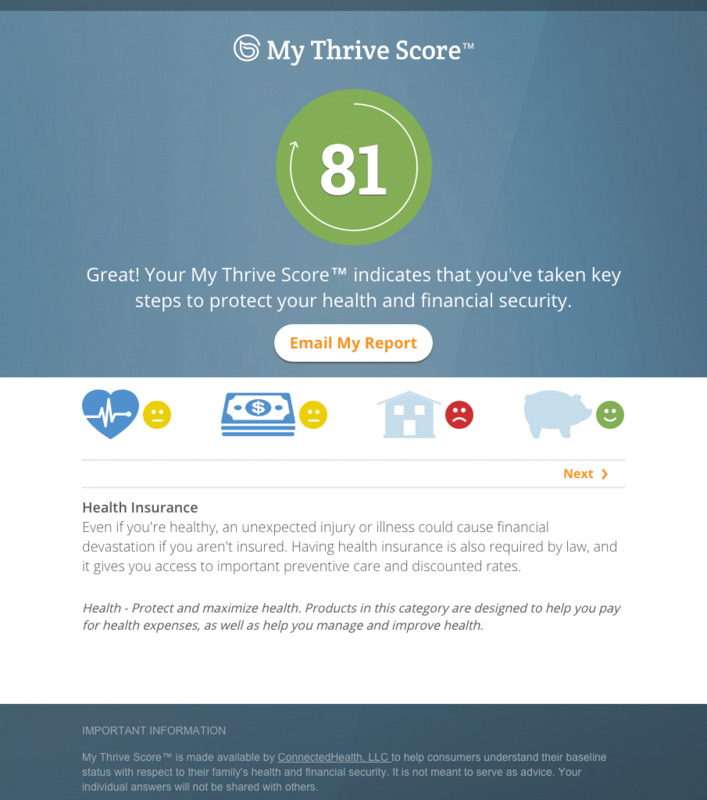 CHICAGO, IL--(Marketwired - April 23, 2015) - ConnectedHealth, the online private insurance exchange company that helps employees achieve better health and financial security, today launches My Thrive Score™, a new product that gives consumers a "credit score" for their health and financial security. This is the industry's first solution that helps people quickly get a holistic picture of four key cornerstones of their life: health, income, assets and future savings. The free version of the tool is available at www.mythrivescore.com. "The concept of building a retirement financial portfolio has been effective in the financial services industry," said Joe Donlan, president of ConnectedHealth. "With My Thrive Score and our shopping platform, we are bringing that concept to the benefits business. Now, employees can get a personalized score to help them understand and assess their financial wellness, which is increasingly important to productivity at home and work. Since more than 60 percent of bankruptcies in the United States are caused by medical bills, it's important that employees understand the connection between health and wealth." When integrated into ConnectedHealth's private exchange technology, My Thrive Score will give people a more robust picture of how their portfolio safeguards their family in the case of devastating health issues. It also makes it easy for employees to shop and purchase health and ancillary coverage online, as well as understand how to protect their health, maximize their income and save money for the future based on their selections. "Personalized recommendations that help employees understand how they might be exposed to financial risk are critical," said Rhonda Marcucci, benefits consultant and partner at Gruppo Marcucci. "With high-deductible health plan adoption on the rise, and more variation in medical plan designs, consumers could find themselves having to pay significant out-of-pocket costs. ConnectedHealth is helping them understand the need for a broader range of products to protect their families." As part of this initiative, ConnectedHealth has released a new white paper entitled, Helping Employees Achieve Health and Financial Security, which explains the value of the company's approach and research done to support consumer engagement in the current benefits market. To download this white paper, visit http://info.connectedhealth.com/thrive-white-paper. ConnectedHealth makes it easy for employees to shop for personalized insurance benefits online. Founded by the pioneers in consumer health care transparency, the company's award-winning e-commerce platform helps businesses control costs and supports their entire workforce in protecting their health and financial security. Learn how ConnectedHealth is reimagining the way employers deliver group and individual benefit strategies at www.ConnectedHealth.com or on LinkedIn, Facebook and Twitter. My Thrive Score "credit score" for consumers' health and financial security.